People often pop round at Christmas with a card and well-wishes and it always pays to have something a little bit festive in the cupboard to break out and share. Lidl have £1 Pantone which just about covers two portions if you slice it into quarters. 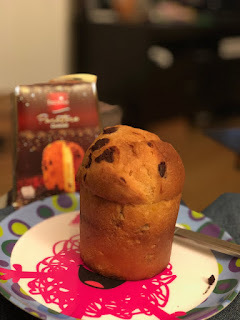 As you'd expect it's just a fairly bready chocolate chip muffin with no frills except for the quite nice box. It does go down very well with a cup of tea too - I guess you'd just have to make sure you have enough of these stashed away in proportion to the amount of visitors you'd expect. Less likely to go off than biscuits (and by that I mean get eaten before the guests arrive) and that little bit more unusual I think these are a reasonably priced hit.